Home › Blog › Ode to Berlin: Why You Have to Go—Run or Not! Some friends of mine lucked out and got into the 2018 Berlin Marathon by lottery. They said to me, “Join us!”—not as a runner (they know my marathon days are over), but “for the ride.” I’ve never gone to a destination race and not run the race. That always seemed a bit extravagant, considering the cost and time. Also, for me, it was sort of, well, outside the point of going to a race. I mean Berlin wasn’t a three-hour drive; it was a 12-hour overnight international plane ride and a weeklong stay. But after much thought, I reasoned, I could be the cheering squad. And oh, what a ride it was! First, there’s the city itself. Berlin didn’t get a mention on my wish list of travel destinations, but now it ranks near the top. It’s a fascinating place. While my running buddies rested their legs the days before the race, I got a metro map and headed out every day from sun-up to sundown to explore what I could of the sprawling city. I couldn’t get enough of its unbelievable yet undeniable history. I was transfixed—a word I’m sure I’ve never used before, but the perfect word to describe my experience. Transfixed in motion, I should say, if that makes any sense, considering all the miles I covered. I mean: World War II. The Cold War. The Berlin Wall. The former East and the former West. The (funky, quirky, artsy, family, historic) neighborhoods. The monuments. The museums. The memorials. And then there was marathon weekend. World-record-setting marathon weekend. The other stuff was just preliminaries. To call it the climactic event of an extraordinary week is a grave understatement. With my friends’ feet rested, we made our way to the expo and later, to the pre-race event at the Brandenburg Gate featuring the elite runners who would be competing. 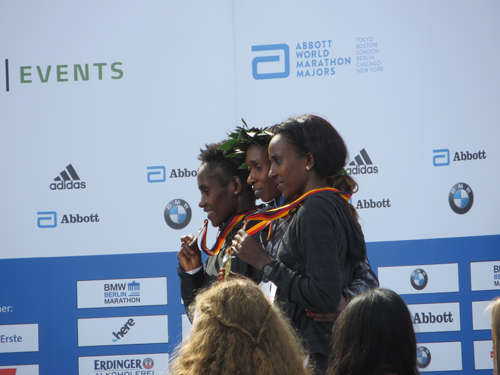 To see the likes of Kipchoge, Cherono, Kipsang, Kipruto, Kiplagat, Dibaba, and the other how-in-the-heck-can-they-possibly-go-so-fast runners in person was like opening the best present you could ever hope for. At least that’s what I thought for a brief 18 hours or so. Until the 2:01:39. You’ve got to be kidding me! You’ve got to be kidding me! How do you believe it? I think all the cogs were set in motion when one of my running buddies, Lisa, managed to somehow inch herself through the mob of people at the pre-race celebration waiting to get a glimpse, perhaps just a blurry photo, of the undebatably best marathoner of all time. That’s thrill enough. But closer, closer she moved until somehow she stretched her hand through the mass of bodies and got an even better gift than the viewing itself—a handshake from Kipchoge. That did it. A good luck charm. It wasn’t the years of training, the intense focus, the dedicated coaching, the thoughtful diet, the self-control. It was a touch of hand. The icing on the cake. Now you know his secret. He gave her some good luck, too. Lisa ran her personal best marathon by 41 minutes. All three of my running buddies got a PR that day. What a race! 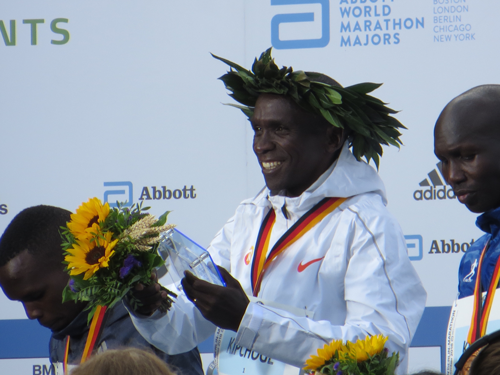 As for me, though a mere spectator, Berlin Marathon day was one of the best days ever. After traversing the city all week, I knew my way around pretty well and mapped out a great route for marathon viewing, including three stops along the course to see the frontrunners pass, and I got a spot at the finish line to watch the crowning of the victors at the awards ceremony. Plus, I saw two of my friends crossing the line. Unlike any other momentous occasion in history, I can say to future running generations, “I was there.” Yes, I was there to see the running of the world-record marathon. And I’m willing to say I don’t think we’ll see a faster-run marathon for a long time—except, of course, by Kipchoge himself. I’ve run a lot of races in my 39 years of running, but my Berlin Marathon was a day I’ll never forget. So to all my fellow runners out there, if you’re lucky enough, go to Berlin. Run the marathon. Or not. Either way, it will be a ride to remember. Kim Crouse runs with the Fleet Feet Streakers, coached by Jen Goff, in Greensboro, NC. 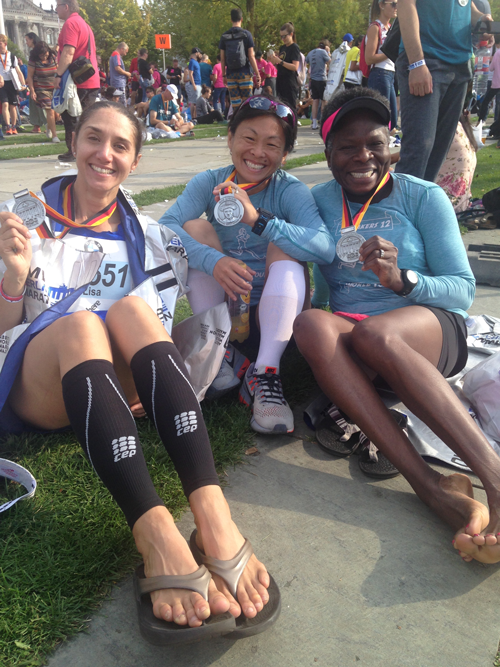 Lisa Aponte-Wolff, Karen Narita, and Idowu (ID) Shofoluwe after finishing the Berlin Marathon. All three run with the Greensboro Fleet Feet Streakers. 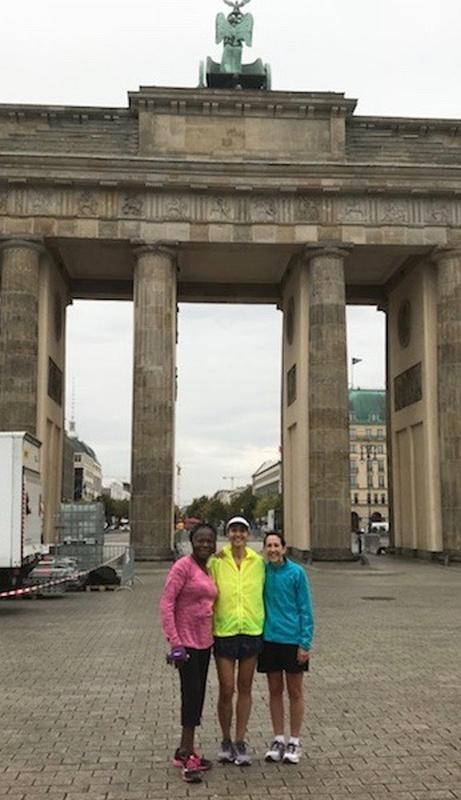 My friends, ID and Lisa, and I make a quick stop at the Brandenburg Gate on a morning run. 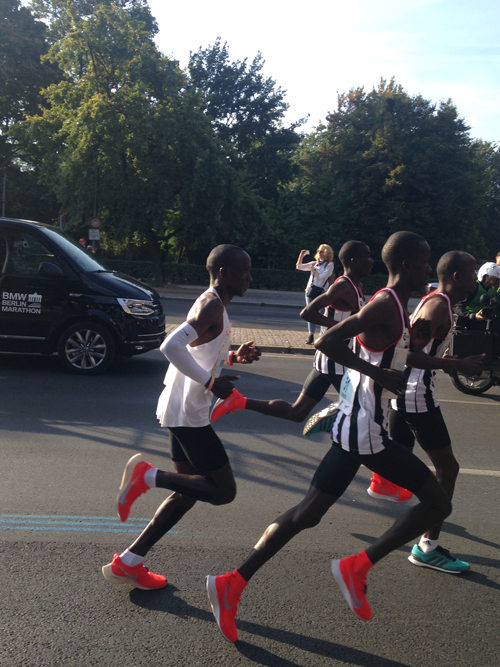 My view of world-record-setter Eliud Kipchoge (left) on the race course. Above and below: I got a great spot to watch the crowning of the victors at the awards ceremony. 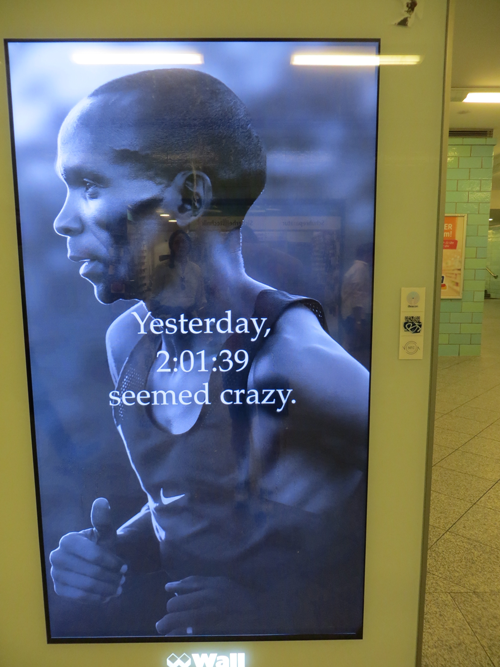 These posters were plastered all over Berlin the morning after the marathon.